Objective To investigate whether placebo controls should be used in the evaluation of surgical interventions. Data sources We searched Medline, Embase, and the Cochrane Controlled Trials Register from their inception to November 2013. Study selection Randomised clinical trials comparing any surgical intervention with placebo. Surgery was defined as any procedure that both changes the anatomy and requires a skin incision or use of endoscopic techniques. Data extraction Three reviewers (KW, BJFD, IR) independently identified the relevant trials and extracted data on study details, outcomes, and harms from included studies. Results In 39 out of 53 (74%) trials there was improvement in the placebo arm and in 27 (51%) trials the effect of placebo did not differ from that of surgery. In 26 (49%) trials, surgery was superior to placebo but the magnitude of the effect of the surgical intervention over that of the placebo was generally small. Serious adverse events were reported in the placebo arm in 18 trials (34%) and in the surgical arm in 22 trials (41.5%); in four trials authors did not specify in which arm the events occurred. However, in many studies adverse events were unrelated to the intervention or associated with the severity of the condition. The existing placebo controlled trials investigated only less invasive procedures that did not involve laparotomy, thoracotomy, craniotomy, or extensive tissue dissection. Conclusions Placebo controlled trial is a powerful, feasible way of showing the efficacy of surgical procedures. The risks of adverse effects associated with the placebo are small. In half of the studies, the results provide evidence against continued use of the investigated surgical procedures. Without well designed placebo controlled trials of surgery, ineffective treatment may continue unchallenged. The increase in the applications for surgical procedures has been driven by a greater involvement of technology in surgical procedures. Such technological advances have made many interventions less invasive, more likely to be endoscopic, and less resembling typical open surgery, such as laparotomy. However, these new procedures are often introduced into surgical practice without any formal evaluation of safety and efficacy, such as using randomised clinical trials. This is because, unlike drug products, such verification is currently not mandated by regulatory authorities.6 Furthermore, there is generally a scarcity of information reported on the surgical learning curves or the iterative development of a new technique. Both existing and innovative surgical practice clearly needs to be evaluated, and any evaluative method should take account of the unique idiosyncrasies and challenges presented by surgical interventions. Placebo controlled randomised clinical trials of surgical interventions are relatively uncommon.15 16 17 Studies published so far have often led to fierce debates on the ethics, feasibility, and role of placebo in surgery.18 19 20 21 One reason for the poor uptake is that many surgeons, as well as ethicists, have voiced concerns about the safety of patients in the placebo group. Many of the concerns are based on personal opinion, with little supporting evidence.18 19 20 21 In the absence of any comprehensive information on the use of placebo controls in surgery, and the lack of evidence for harm or benefit of incorporating a placebo intervention, a systematic review of placebo use in surgical trials is warranted. We assessed whether placebo controls should be used in the evaluation of surgical interventions by systematically reviewing all clinical trials in which the efficacy of surgery was compared with a placebo control. 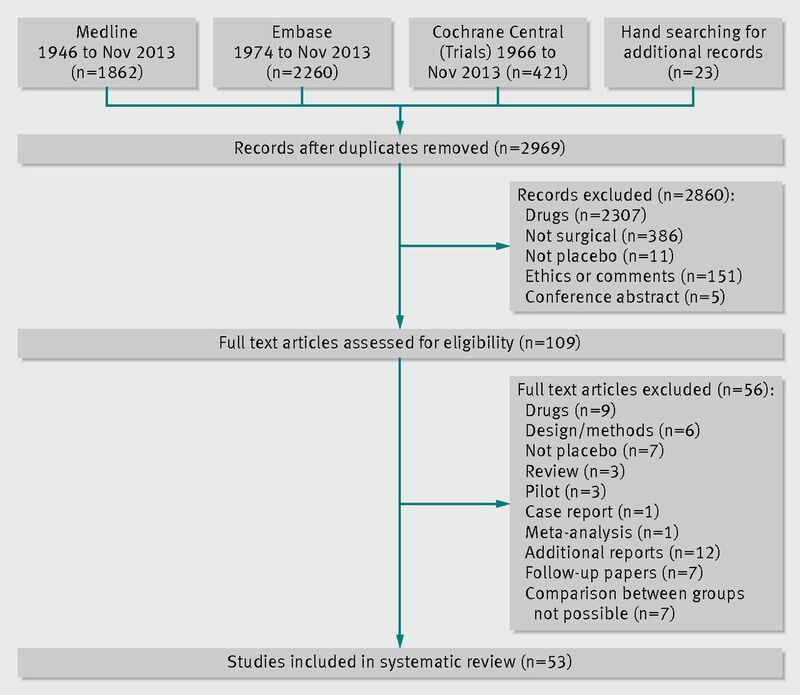 We performed a systematic review adhering to published guidance from the Cochrane Collaboration.22 Studies were eligible if they were randomised clinical trials in which the efficacy of surgery was compared with placebo. We defined surgery as any interventional procedure that changes the anatomy and requires a skin incision or the use of endoscopic techniques; dental studies were excluded. We used the term placebo to refer to a surgical placebo, a sham surgery, or an imitation procedure intended to mimic the active intervention; including the scenario when a scope was inserted and nothing was done but patients were sedated or under general anaesthesia and could not distinguish whether or not they underwent the actual surgery. We did not limit the inclusion criteria to any particular condition, patient group, intervention, or type of outcome. We excluded studies investigating anaesthesia or other drug substances used perioperatively. We developed search strategies for three electronic databases: Medline (Ovid), Embase (Ovid), and the Cochrane Central Register of Controlled Trials. We searched the databases from the date of their inception to 14 November 2013, with no restriction on language. (See supplementary appendix 1 for details of the search terms.) We did not systematically search for studies reported only as conference abstracts. Three reviewers (KW, IR, BJFD) independently screened the initial set of records identified from the search and then screened the full text of any potentially relevant articles. Each reviewer independently assessed the eligibility of each study, and the final list of included studies was agreed by consensus. We also screened the references of the relevant articles. Furthermore, we searched ClinicalTrials.gov (on 14 November 2013), a database of registered randomised clinical trials, to identify any recently completed or ongoing studies. If several articles reported outcomes from a single trial (that is, with the same authors, location, patient population, and recruitment dates), we only included the article reporting the main outcome for the trial. We used a standardised data extraction form to collect information about the characteristics of each study as well as the clinical improvement and superiority of the surgical intervention compared with the placebo for the main study outcome; as reported by the authors in the published article. For each study we extracted the year of publication; study population; condition; intervention; outcomes; sample size; number of participants; number of events, as well as mean and standard deviation for continuous outcomes; and serious adverse events and whether they were related to the procedure. To reduce the chance of errors, the three review authors extracted data separately, checked the entries for consistency, and agreed on a single set of data. The three review authors also independently assessed the risk of bias in the included studies using the risk of bias tool criteria recommended by the Cochrane guidelines.22 23 In particular we assessed the method of random sequence generation; concealment of treatment; blinding of participants, care providers, and assessors; success of blinding; and use of intention to treat analysis. We assessed the beneficial effect of the surgical intervention on the basis of the original conclusions as any improvement in the main outcome of the trial and as superiority of the surgical treatment over the placebo—that is, the additional benefits of the critical surgical element. Moreover, we calculated statistically significant difference between the surgical intervention and placebo using the information reported in the results section of each study. We calculated the odds ratio for binary outcomes and the effect size for continuous outcomes using the effect estimate from analysis of covariance, the difference in change score, or the difference in postoperative score, depending on the method of analysis and data reported within each individual study. We included only the primary outcome measure, whenever it was explicitly specified. If two primary outcomes were reported, we used both; however, when there were several main outcome measures, we chose those reported in the abstract or those used in other studies, so that the forest plots present similar outcomes. Where necessary, we changed the direction of effect so that the improvement was consistently presented in the same way in the forest plots. As a measure of harms, we examined serious adverse events and whether they were attributable to the surgical or the placebo intervention. An optimal strategy to identify reports of adverse events does not exist.24 We defined serious adverse events as harmful events that occurred during the trial, such as prolonged hospital stay, and events that required admission to hospital or resulted in death. We summarised the serious adverse events data using a grading system according to their severity, as definitely, likely or unlikely to be serious, and a grading system according to relation between the event and the procedure as definitely, likely, unlikely to be related to the procedure. Wherever possible, we used the results from the intention to treat analysis. Most studies did not provide sufficient information about harms to enable a formal statistical analysis. Owing to the considerable heterogeneity of conditions, interventions, and outcomes it was not feasible to combine the results of individual studies in a meta-analysis. We present a descriptive analysis of the results of each individual study and present data in tables and figures. All analyses were carried out in Stata (version 12.1). The search of Medline, Embase, and Cochrane databases identified a total of 4543 records. We found an additional 23 articles using a hand search of relevant literature and the references of the articles identified using the database search. Out of these 4566 records, 1597 duplicates were discarded, leaving 2969 records; of these, 2860 did not meet inclusion criteria, and a further 56 studies were excluded after reviewing the full text of the article. Among them were 12 articles reporting additional outcomes of a trial, seven follow-up papers, and seven studies that reported results in a way that made the comparison between the surgical and placebo arm impossible. This resulted in 53 full text articles that met the inclusion criteria and were included in this review. Figure 1⇓ details the study identification and reasons for exclusion. A keyword search of the ClinicalTrials.gov database identified 14 relevant trials, including two studies already found using the electronic search25 26 and 12 studies that were not yet available as full text articles in November 2013. Overall, 39 of the 53 (74%) included studies were published after 2000. Most of the trials investigated minor and not directly life threatening conditions, such as severe obesity (n=7; 13%) or gastro-oesophageal reflux (n=6; 11%). The most common type of intervention was endoscopy, with 23 trials (43%) using this technique as a part of the investigated procedure. Thirteen trials (25%) used some exogenous material, implant, or tissue, and a further six used balloons. Most studies reported subjective outcomes such as pain (n=13; 25%), improvement in symptoms or function (n=17; 32%), or quality of life (n=8; 15%). Less than half of the trials (n=22; 42%) reported an objective primary outcome—that is, measures that did not depend on judgment of patients or assessors. The majority of trials were small; the number of randomised participants ranged between 10 and 298, with a median of 60. No placebo controlled surgical trials investigating more invasive surgical procedures such as laparotomy, thoracotomy, craniotomy, or extensive tissue dissection were identified. Tables 1⇓ and 2⇓ list the characteristics of each trial. In half of the included studies (n=26; 49%) the authors reported superiority of the surgical procedure over the placebo intervention, and in the remaining trials (n=27; 51%) the active surgical procedure was not statistically different from that of the placebo intervention (table 3). Overall, the magnitude of the treatment effect when the active surgical intervention group was compared with the placebo group was small but generally favoured the surgical treatment. The forest plots in figures 2⇓ and 3⇓ present the effect sizes and odds ratios for individual trials. In just under half of the trials (n=23/53; 43%) the authors stated that there were no serious adverse events, although sometimes they reported minor adverse events (table 2). Three out of 53 studies (6%) did not report any information about adverse events. In the remaining 27 studies (51%), serious adverse events occurred in at least one of the study arms (table 1). 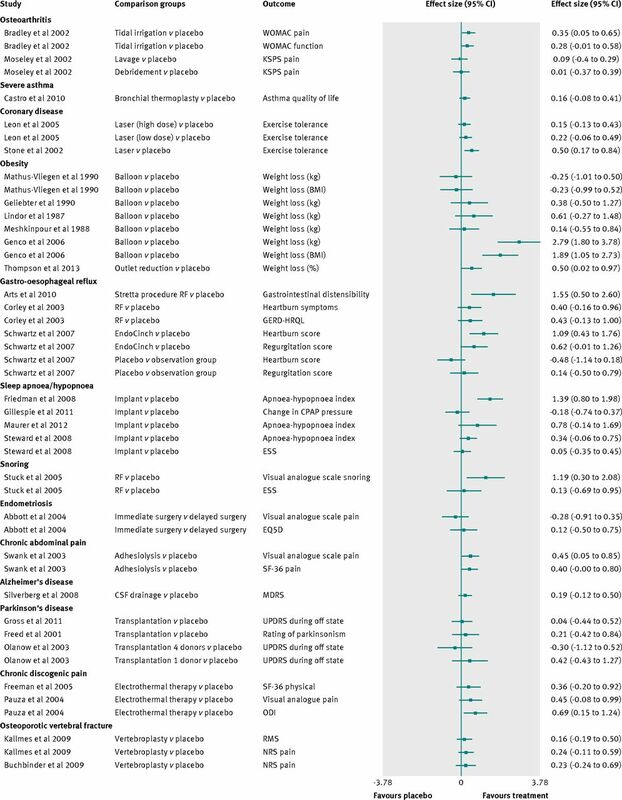 In 17 of these 27 studies, serious adverse events were observed in both the surgical and the placebo arms, in five studies serious adverse events were only present in the active group, whereas in four studies the authors did not specify in which group the serious adverse events occurred. Not all serious adverse events were related to the procedure. For example, in six trials on gastrointestinal bleeding, deaths, rebleeds, or continuous bleeding were the main outcome of the study and were a result of the investigated condition and of the procedure being ineffective rather than it being harmful. In only two of these trials, adverse events, such as a perforation, were directly related to the intervention. In several trials, adverse events were rare (<5% of patients) or were unrelated to the procedure—for example, death from other causes. In general, the placebo arm was reported to be safer and adverse events were more serious and more common in the active group. The only adverse event reported as related to anaesthesia was in a trial by Schwartz and colleagues,56 in which one patient in the placebo group had a bruise as result of a misplaced intravenous line during sedation. Surgical randomised clinical trials incorporating a placebo arm are rare but this review shows that the results of many of the trials provide clear evidence against continued use of the investigated surgical procedures and in well designed studies the risks of adverse effects are small and the placebo arm is safer than surgery. The identified surgical randomised clinical trials were heterogeneous. The existing placebo controlled trials investigated only less invasive procedures that did not involve laparotomy, thoracotomy, craniotomy, or extensive tissue dissection. About a half of the reviewed trials showed superiority of the surgical procedure over placebo intervention, but the magnitude of the effect directly related to the crucial surgical element was generally small. The majority of the trials showed an improvement in the surgical group as well as in the placebo group, which would suggest that some surgical procedures may have a placebo effect and that some of the benefits of surgery are related to factors other than the crucial surgical element. Serious adverse events were reported in half of the reviewed trials, and the severity of possible serious adverse events was often related to the seriousness of the investigated condition and the invasiveness of the chosen procedure. Generally, the incidence of complications in the placebo group was lower than that in the surgical arm. Modern surgery involves not only open surgery but also minimally invasive procedures, implants, and transplants; therefore, the boundary between surgery and other medical procedures was not always clear. In addition, identifying unique studies was not always straightforward—that is, differentiating between papers reporting two similar trials or different outcomes of the same trial. Many trials reported several outcomes, often without identifying the primary measure. As a consequence we had to report only the outcomes for which the study had been powered, those reported in the abstract, or those used in other similar studies. The lack of a clear primary outcome also meant that we could not report a single primary outcome per study. The main benefit and value of placebo controlled randomised clinical trials is their ability to show the real efficacy of a surgical intervention. If a procedure is effective and superior over the placebo, the case is strong for it to be commissioned and funded. The opposite is also true; if a surgical procedure has no benefit over placebo the argument is strong for stopping its use. The well designed placebo controlled trial of surgery is a useful tool to challenge the continued commissioning and use of ineffective treatments. The trial participants usually gain direct benefits, the main one being the perceived improvement attributable to the intervention. Whether this is acceptable by doctors and patients is the subject of an ongoing debate.71 72 Indirect benefits may include confirming or disproving the primary diagnosis thereby allowing patients to be referred for a more appropriate treatment. A reduced waiting time or receiving treatment free of charge (for treatment that is ordinarily paid for by patients) is a further potential advantage of taking part in a trial. The negative consequences for the trial patients may be considered mainly in terms of harms. In most of the trials, the investigated conditions were non-life threatening and the main aim of surgery was to improve function, symptoms, and quality of life, to reduce pain, or to remove the need for drug use. In these trials the harms were either lack of improvement or complications arising from the procedure, such as perforation after endoscopy. In the trials on gastrointestinal bleeding, the investigated condition was potentially life threatening and the procedure was not elective. In these six trials the negative events, such as bleeding and deaths, were the primary outcome and an indicator that the intervention was ineffective. Placebo controlled surgical trials raise important ethical concerns18 19 20 but are justified when there is a genuine equipoise19; that is, a disagreement in the medical community about whether one treatment is superior to another, because standard treatment does not exist or its efficacy is questioned. Such trials conform to the ethical principles of non-maleficence—that is, the duty not to inflict expected harm, and justice.21 Surgical intervention may be associated with greater risk than drug intervention; therefore, to be justified it must be associated with greater “pure” benefit to outweigh such risks. Surgical trials are justified by equipoise not only when there is uncertainty about pure benefit, but also when there is uncertainty about whether benefit outweighs harms. If a standard medical treatment is available, it may be offered as a part of the study, as in the trials on tissue transplantation in Parkinson’s disease, in which the participants continued their L-dopa drug. In addition to that, if one of the treatments in the trial becomes recognised as effective or a new treatment becomes available during the conduct of the trial, equipoise is disturbed and ethically the study should be stopped, as was the case in one trial61 where the intervention was accepted by the insurer as a standard procedure and the trial was terminated early, before it could show the superiority of the active procedure. Another ethical concern is deception and risk to the trust between patients and surgeons. In the majority of studies and always in the recent trials, patients were informed about taking part in a placebo controlled trial, and informed consent was obtained. In the study by Moseley and colleagues, participants were also asked to write a clause in their notes acknowledging the fact that they might receive placebo intervention and that placebo might not be effective.75 If patients are fully informed and give proper consent, then from the ethical point of view the conditions of free consent and autonomy are fulfilled. Surgery of any form, including placebo surgery, is associated with some level of risk, whereas a placebo tablet or drug is not. Therefore the balance between risks and benefits in surgical placebo controlled randomised clinical trials is different from that in drug trials. In most of the studies that reported serious adverse events, such complications were expected in the investigated conditions; even in the study on Alzheimer’s disease, mortality was comparable with other trials.37 What matters most is that risk is minimised and that actual harm is as small as possible.76 77 78 In the reviewed trials, the placebo arm was usually designed to pose as little risk to the participants as possible and to be significantly less risky than the active surgical procedure. In a situation where there is no certainty that the surgery is effective, the balance between risks and benefits within a study actually may be better in the placebo arm. For example, in the trials on fetal nigral tissue transplantation for Parkinson’s disease, the active treatment was no better than placebo in terms of outcome and resulted in more severe side effects, such as dystonias and dyskinesias. Moreover, the risk of infection and other complications associated with the actual tissue implantation was much higher than the risk in the placebo group. Interestingly, in the study by Freed and colleagues,38 patients who had been in the placebo group still opted for the surgical procedure after the trial, despite the fact that no clear benefit of fetal nigral tissue transplantation had been shown. This may be because patients believe that invasive,12 new,79 and expensive80 procedures are actually more effective. In contrast, the results of the trials on the efficacy of vertebroplasty62 64 were challenged and their authors were criticised for undermining the evidence supporting this commonly used procedure. The critics acknowledged that the injection of cement might be associated with many side effects, some of them potentially dangerous, but they argued that the treatment was justified because earlier unblinded trials had shown superiority of vertebroplasty over medical treatment.62 64 86 This argument against the validity of placebo controlled trials neglected any potential placebo effect of vertebroplasty. The placebo component of surgery has to be explored and better understood. Future surgical trials need to be better designed and to include the observational control arm to allow the estimation of the magnitude of the placebo effect while controlling for non-specific factors such as spontaneous improvement or regression to the mean. We need to know the size of these effects and factors that influence their magnitude in order to properly interpret results of clinical trials in general, especially as many surgical trials nowadays use an observational design or case registers. Placebo controlled trials in surgery are as important as they are in medicine, and they are justified in the same way. They are powerful, feasible way of showing the efficacy of surgical procedures. They are necessary to protect the welfare of present and future patients as well as to conduct proper cost effectiveness analyses. Only then may publicly funded surgical interventions be distributed fairly and justly. Without such studies ineffective treatment may continue unchallenged. As surgery is inherently associated with some risk, it is important that the surgical treatment is truly effective and that the benefits outweigh the risks. Placebo controlled surgical trials are not free from adverse events but risks are generally minimal in well designed trials and the control arm is much safer than the active treatment. However, this review highlighted the need for better reporting of trials, including serious adverse events and their relation to a particular element of surgical procedure. A need exists to “demystify” and extend the use of the surgical placebo in clinical trials. These should result in a greater acceptance of this type of trial by the surgical community, ethics committees, funding bodies, and patients. In turn, this would lead to more studies, better guidelines on the design and reporting of studies, and a larger body of evidence about efficacy and the risks of surgical interventions. Placebo controlled surgical trials are highly informative and should be considered for selected procedures. Contributors: KW, AJC, and DJB conceived and designed the study. KW, AJ, SH, and GSC designed the search strategy and statistical analysis. KW, IR, and BJFD collected and managed the data. KW drafted the manuscript and is the guarantor of the study. KW, AJC, DJB, IR, BJFD, DB, JS, SH, and GSC critically revised the manuscript for important intellectual content. All authors had full access to all of the data in the study and can take responsibility for the integrity of the data and the accuracy of the data analysis, and revised and approved the final version of the article. Funding: This study was funded by the NIHR Oxford Musculoskeletal Biomedical Research Unit. The funding source had no role in the design and conduct of the study, in the collection, analysis and interpretation of the data, or in the preparation, review, or approval of the manuscript. Competing interests: All authors have completed the ICMJE uniform disclosure form at www.icmje.org/coi_disclosure.pdf and declare: the authors are involved in a placebo controlled surgical trial on shoulder pain (NCT01623011); no support from any organisation for the submitted work; no financial relationships with any organisations that might have an interest in the submitted work in the previous three years; no other relationships or activities that could appear to have influenced the submitted work. Transparency: The lead author (the manuscript’s guarantor) affirms that the manuscript is an honest, accurate, and transparent account of the study being reported; no important aspects of the study have been omitted. Li G, Warner M, Lange BH, Lin H, Sun LS. Epidemiology of anesthesia-related mortality in the United States, 1999-2005. Anesthesiology2009;110:759-65. Gottschalk A, Van Aken H, Zenz M, Standl T. Is anesthesia dangerous? Dtsch Arztebl Int2011;108:469-74. Kable AK, Gibberd RW, Spigelman AD. Adverse events in surgical patients in Australia. Int J Qual Health Care2002;14:269-76. Zegers M, de Bruijne M, de Keizer B, Merten H, Groenewegen P, van der Wal G, et al. The incidence, root-causes, and outcomes of adverse events in surgical units: implication for potential prevention strategies. Patient Saf Surg2011;5:13. Calland JF, Adams RB, Benjamin DK Jr, O’Connor MJ, Chandrasekhara V, Guerlain S, et al. Thirty-day postoperative death rate at an academic medical center. Ann Surg2002;235:690-6; discussion 6-8. McCulloch P, Altman DG, Campbell WB, Flum DR, Glasziou P, Marshall JC, et al. No surgical innovation without evaluation: the IDEAL recommendations. Lancet2009;374:1105-12. Ernst E, Resch KL. Concept of true and perceived placebo effects. BMJ1995;311:551-3. Tenery R, Rakatansky H, Riddick FAJ, Goldrich MS, Morse LJ, O’Bannon JM 3rd, et al. Surgical “placebo” controls. Ann Surg2002;235:303-7. Braunholtz DA, Edwards SJL, Lilford RJ. Are randomized clinical trials good for us (in the short term)? Evidence for a “trial effect”. J Clin Epidemiol2001;54:217-24. Wood L, Egger M, Gluud LL, Schulz KF, Juni P, Altman DG, et al. Empirical evidence of bias in treatment effect estimates in controlled trials with different interventions and outcomes: meta-epidemiological study. BMJ2008;336:601-5. Moerman DE, Jonas WB. Deconstructing the placebo effect and finding the meaning response. Ann Intern Med 2002 March 19, 2002;136(6):471-6. De Craen AJ, Tijssen JG, de Gans J, Kleijnen J. Placebo effect in the acute treatment of migraine: subcutaneous placebos are better than oral placebos. J Neurol2000;247:183-8. Thomas KB. General practice consultations: is there any point in being positive? BMJ1987;294:1200-2. Wenner DM, Brody BA, Jarman AF, Kolman JM, Wray NP, Ashton CM. Do surgical trials meet the scientific standards for clinical trials? J Am Coll Surg2012;215:722-30. Gelijns AC, Ascheim DD, Parides MK, Kent KC, Moskowitz AJ. Randomized trials in surgery. Surgery2009;145:581-7. Howes N, Chagla L, Thorpe M, McCulloch P. Surgical practice is evidence based. Br J Surg1997;84:1220-3. Macklin R. The ethical problems with sham surgery in clinical research. N Engl J Med1999;341:992-6. Miller FG. Sham surgery: an ethical analysis. Am J Bioeth2003;3:41-8. Horng SBA, Miller FG. Ethical framework for the use of sham procedures in clinical trials. Crit Care Med2003;31(3 Suppl):S126-30. London AJ, Kadane JB. Placebos that harm: sham surgery controls in clinical trials. Stat Methods Med Res2002;11:413-27. Van Tulder M, Furlan A, Bombardier C, Bouter L. Updated method guidelines for systematic reviews in the cochrane collaboration. Spine (Phila Pa 1976)2003;28:1290-9. Loke Y, Price D, Herxheimer A, Group tCAEM. Systematic reviews of adverse effects: framework for a structured approach. BMC Med Res Methodol2007;7:32. Gillespie MB, Wylie PE, Lee-Chiong T, Rapoport DM. Effect of palatal implants on continuous positive airway pressure and compliance. Otolaryngol Head Neck Surg2011;144:230-6. Steward DL, Huntley TC, Woodson BT, Surdulescu V. Palate implants for obstructive sleep apnea: Multi-institution, randomized, placebo-controlled study. Otolaryngol Head Neck Surg2008;139:506-10. Davys HJ, Turner DE, Helliwell PS, Conaghan PG, Emery P, Woodburn J. Debridement of plantar callosities in rheumatoid arthritis: a randomized controlled trial. Rheumatology (Oxford, England)2005;44:207-10. Deviere J, Costamagna G, Neuhaus H, Voderholzer W, Louis H, Tringali A, et al. Nonresorbable copolymer implantation for gastroesophageal reflux disease: a randomized sham-controlled multicenter trial. Gastroenterology2005;128:532-40. Genco A, Cipriano M, Bacci V, Cuzzolaro M, Materia A, Raparelli L, et al. BioEnterics[reg] Intragastric Balloon (BIB[reg]): a short-term, double-blind, randomised, controlled, crossover study on weight reduction in morbidly obese patients. Int J Obes Relat Metab Disord2006;30:129-33. Arts J, Bisschops R, Blondeau K, Farre R, Vos R, Holvoet L, et al. A double-blind sham-controlled study of the effect of radiofrequency energy on symptoms and distensibility of the gastro-esophageal junction in GERD. Am J Gastroenterol2012;107:222-30. Fleischer D. Endoscopic Nd:YAG laser therapy for active esophageal variceal bleeding. A randomized controlled study. Gastrointest Endosc1985;31:4-9. Fullarton GM, Birnie GG, Macdonald A, Murray WR. Controlled trial of heater probe treatment in bleeding peptic ulcers. Br J Surg1989;76:541-4. Friedman M, Schalch P, Lin HC, Kakodkar KA, Joseph NJ, Mazloom N. Palatal implants for the treatment of snoring and obstructive sleep apnea/hypopnea syndrome. Otolaryngol Head Neck Surg2008;138:209-16. Bajbouj M, Becker V, Eckel F, Miehlke S, Pech O, Prinz C, et al. Argon plasma coagulation of cervical heterotopic gastric mucosa as an alternative treatment for globus sensations. Gastroenterology2009;137:440-4. Van Schie CH, Whalley A, Vileikyte L, Wignall T, Hollis S, Boulton AJ. Efficacy of injected liquid silicone in the diabetic foot to reduce risk factors for ulceration: a randomized double-blind placebo-controlled trial. Diabetes Care2000;23:634-8. Thompson C, Chand B, Chen Y, Demarco D, Miller L, Schweitzer M, et al. Endoscopic suturing for transoral outlet reduction increases weight loss after Roux-en-Y gastric bypass surgery. Gastroenterology2013;145:129-37. Silverberg GD, Mayo M, Saul T, Fellmann J, Carvalho J, McGuire D. Continuous CSF drainage in AD: results of a double-blind, randomized, placebo-controlled study. Neurology2008;71:202-9. Freed CR, Greene PE, Breeze RE, Tsai W-Y, DuMouchel W, Kao R, et al. Transplantation of embryonic dopamine neurons for severe Parkinson’s disease. N Engl J Med2001;344:710-9. Dowson A, Mullen MJ, Peatfield R, Muir K, Khan AA, Wells C, et al. Migraine Intervention With STARFlex Technology (MIST) trial: a prospective, multicenter, double-blind, sham-controlled trial to evaluate the effectiveness of patent foramen ovale closure with STARFlex septal repair implant to resolve refractory migraine headache. Circulation2008;117:1397-404. Olanow CW, Goetz CG, Kordower JH, Stoessl AJ, Sossi V, Brin MF, et al. A double-blind controlled trial of bilateral fetal nigral transplantation in Parkinson’s disease. Ann Neurol2003;54:403-14. Freeman BJC, Fraser RD, Cain CMJ, Hall DJ, Chapple DCL. A randomized, double-blind, controlled trial: intradiscal electrothermal therapy versus placebo for the treatment of chronic discogenic low back pain. Spine2369;30:2369-77. Baeck LJJ, Liukko T, Rantanen I, Peltola JS, Partinen M, Ylikoski J, et al. Radiofrequency surgery of the soft palate in the treatment of mild obstructive sleep apnea is not effective as a single-stage procedure: a randomized single-blinded placebo-controlled trial. Laryngoscope2009;119:1621-7. Hartigan P. Sclerotherapy for male alcoholic cirrhotic patients who have bled from esophageal varices: results of a randomized, multicenter clinical trial. Hepatology1994;20:618-25. Stone GW, Teirstein PS, Rubenstein R, Schmidt D, Whitlow PL, Kosinski EJ, et al. A prospective, multicenter, randomized trial of percutaneous transmyocardial laser revascularization in patients with nonrecanalizable chronic total occlusions. J Am Coll Cardiol2002;39:1581-7. Salem M, Rotevatn S, Stavnes S, Brekke M, Vollset SE, Nordrehaug JE. Usefulness and safety of percutaneous myocardial laser revascularization for refractory angina pectoris. Am J Cardiol2004;93:1086-91. Geenen JE, Hogan WJ, Dodds WJ, Toouli J, Venu RP. The efficacy of endoscopic sphincterotomy after cholecystectomy in patients with sphincter-of-Oddi dysfunction. N Engl J Med1989;320:82-7. Rothstein R, Filipi C, Caca K, Pruitt R, Mergener K, Torquati A, et al. Endoscopic full-thickness plication for the treatment of gastroesophageal reflux disease: a randomized, sham-controlled trial. Gastroenterology. 2006;131:704-12. Shaheen NJ, Sharma P, Overholt BF, Wolfsen HC, Sampliner RE, Wang KK, et al. Radiofrequency ablation in Barrett’s esophagus with dysplasia. N Engl J Med2009;360:2277-88. Sutton CJ, Ewen SP, Whitelaw N, Haines P. Prospective, randomized, double-blind, controlled trial of laser laparoscopy in the treatment of pelvic pain associated with minimal, mild, and moderate endometriosis. Fertil Steril1994;62:696-700. Castro M, Rubin AS, Laviolette M, Fiterman J, De Andrade Lima M, Shah PL, et al. Effectiveness and safety of bronchial thermoplasty in the treatment of severe asthma. Am J Respir Crit Care Med2010;181:116-24. Abbott J, Hawe J, Hunter D, Holmes M, Finn P, Garry R. Laparoscopic excision of endometriosis: a randomized, placebo-controlled trial. Fertil Steril2004;82:878-84. Laine L. Multipolar electrocoagulation in the treatment of active upper gastrointestinal tract hemorrhage. A prospective controlled trial. N Engl J Med1987;316:1613-7. Swank DJ, Swank-Bordewijk SCG, Hop WCJ, van Erp WFM, Janssen IMC, Bonjer HJ, et al. Laparoscopic adhesiolysis in patients with chronic abdominal pain: a blinded randomised controlled multi-centre trial. Lancet2003;361:1247-51. Bradley JD, Heilman DK, Katz BP, Gsell P, Wallick JE, Brandt KD. Tidal irrigation as treatment for knee osteoarthritis: a sham-controlled, randomized, double-blinded evaluation. Arthritis Rheum2002;46:100-8. Guyuron B, Reed D, Kriegler JS, Davis J, Pashmini N, Amini S. A placebo-controlled surgical trial of the treatment of migraine headaches. Plast Reconstr Surg2009;124:461-8. Schwartz MP, Wellink H, Gooszen HG, Conchillo JM, Samsom M, Smout AJPM. Endoscopic gastroplication for the treatment of gastro-oesophageal reflux disease: a randomised, sham-controlled trial. Gut2007;56:20-8. Pauza KJ, Howell S, Dreyfuss P, Peloza JH, Dawson K, Bogduk N. A randomized, placebo-controlled trial of intradiscal electrothermal therapy for the treatment of discogenic low back pain. Spine J2004;4:27-35. Stuck BA, Sauter A, Hormann K, Verse T, Maurer JT. Radiofrequency surgery of the soft palate in the treatment of snoring. A placebo-controlled trial. Sleep2005;28:847-50. Montgomery M, Hakanson B, Ljungqvist O, Ahlman B, Thorell A. Twelve months’ follow-up after treatment with the EndoCinch endoscopic technique for gastro-oesophageal reflux disease: a randomized, placebo-controlled study. Scand J Gastroenterol1382;41:1382-9. Hogan RB, Johnston JH, Long BW, Sones JQ, Ardell Hinton L, Bunge J, et al. A double-blind, randomized, sham-controlled trial of the gastric bubble for obesity. Gastrointest Endosc1989;35:381-5. Jarrell J, Mohindra R, Ross S, Taenzer P, Brant R. Laparoscopy and reported pain among patients with endometriosis. J Obstet Gynaecol Can2005;27:477-85. Kallmes DF, Comstock BA, Heagerty PJ, Turner JA, Wilson DJ, Diamond TH, et al. A randomized trial of vertebroplasty for osteoporotic spinal fractures. N Engl J Med2009;361:569-79. Gross RE, Watts RL, Hauser RA, Bakay RAE, Reichmann H, von Kummer R, et al. Intrastriatal transplantation of microcarrier-bound human retinal pigment epithelial cells versus sham surgery in patients with advanced Parkinson’s disease: a double-blind, randomised, controlled trial. Lancet Neurol2011;10:509-19. Buchbinder R, Osborne RH, Ebeling PR, Wark JD, Mitchell P, Wriedt C, et al. A randomized trial of vertebroplasty for painful osteoporotic vertebral fractures. N Engl J Med2009;361:557-68. Lee PE, Kung RC, Drutz HP. Periurethral autologous fat injection as treatment for female stress urinary incontinence: a randomized double-blind controlled trial. J Urol2001;165:153-8. De Craen AJ, Kaptchuk TJ, Tijssen JG, Kleijnen J. Placebos and placebo effects in medicine: historical overview. J R Soc Med1999;92:511-5. Kaptchuk TJ. Powerful placebo: the dark side of the randomised controlled trial. Lancet 19986;351:1722-5. Beecher HK. The powerful placebo. JAMA1955;159:1602-6. Haidich A-B, Birtsou C, Dardavessis T, Tirodimos I, Arvanitidou M. The quality of safety reporting in trials is still suboptimal: survey of major general medical journals. J Clin Epidemiol2011;64:124-35. Ioannidis JPA, Evans SJW, Gøtzsche PC, O’Neill RT, Altman DG, Schulz K, et al. Better reporting of harms in randomized trials: an extension of the CONSORT statement. Ann Intern Med2004;141:781-8. 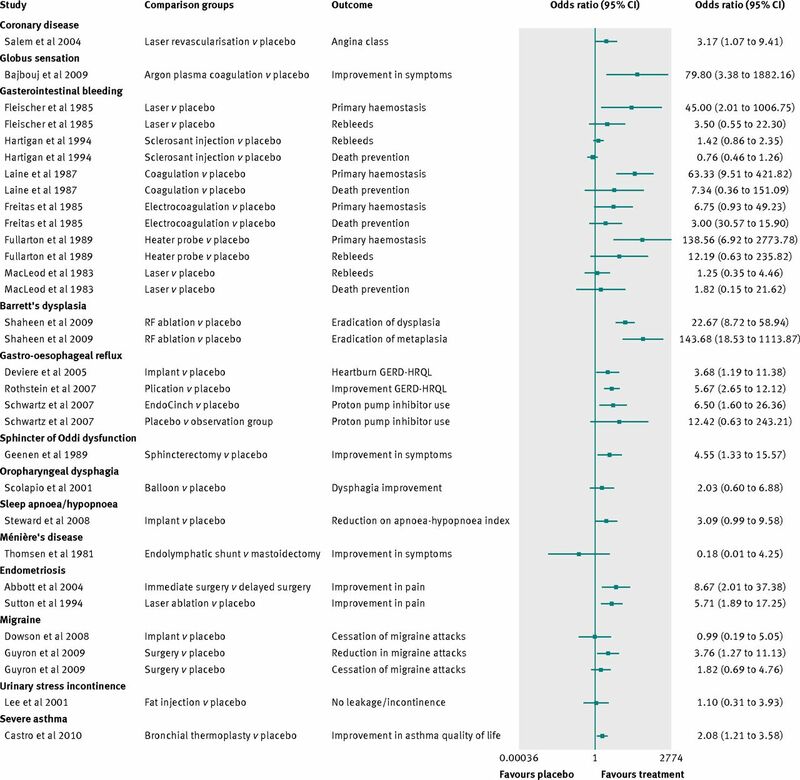 Fassler M, Meissner K, Schneider A, Linde K. Frequency and circumstances of placebo use in clinical practice - a systematic review of empirical studies. BMC Med2010;8:15. Hull SC, Colloca L, Avins A, Gordon NP, Somkin CP, Kaptchuk TJ, et al. Patients’ attitudes about the use of placebo treatments: telephone survey. BMJ2013;347:f2757. Kass NE, Faden RR, Goodman SN, Pronovost P, Tunis S, Beauchamp TL. The research-treatment distinction: a problematic approach for determining which activities should have ethical oversight. Hastings Cent Rep2013;43(s1):S4-15. Savulescu J, Hope T. Ethics of research In: J Skorupski, ed. The Routledge companion to ethics. Routledge, 2010:781-95. Savulescu J. Harm, ethics committees and the gene therapy death. J Med Ethics2001;27:148-50. Savulescu J. Commentary: safety of participants in non-therapeutic research must be ensured. BMJ1998;316:891-2; discussion 3-4. Walsh BT, Seidman SN, Sysko R, Gould M. Placebo response in studies of major depression. JAMA2002;287:1840-7. Waber RL, Shiv B, Carmon Z, Ariely D. Commercial Features of Placebo and Therapeutic Efficacy. JAMA. 2008 March 5, 2008;299(9):1016-7. Cobb LA, Thomas GI, Dillard DH, Merendino KA, Bruce RA. An evaluation of internal-mammary-artery ligation by a double-blind technic. N Engl J Med1959;260:1115-8. Felson DT, Buckwalter J. Débridement and lavage for osteoarthritis of the knee. N Engl J Med2002;347:132-3. Fischbach GD, McKhann GM. Cell therapy for Parkinson’s disease. N Engl J Med2001;344:763-5. Grossman RG. Cell transplantation in Parkinson’s disease: implications for human clinical trials. Neurosurgery2001;49:580-2. Freeman TB, Vawter DE, Leaverton PE, Godbold JH, Hauser RA, Goetz CG, et al. Use of placebo surgery in controlled trials of a cellular-based therapy for Parkinson’s disease. N Engl J Med1999;341:988-92. Weinstein JN. Balancing science and informed choice in decisions about vertebroplasty. N Engl J Med2009;361:619-21.